Sunday it was my step father’s birthday, and we had a bad combination of snow, no chains, and hills, so we walked the 2 miles up to the parent’s house. It gave me time to think about the neighbors, and I realized I have something to say. 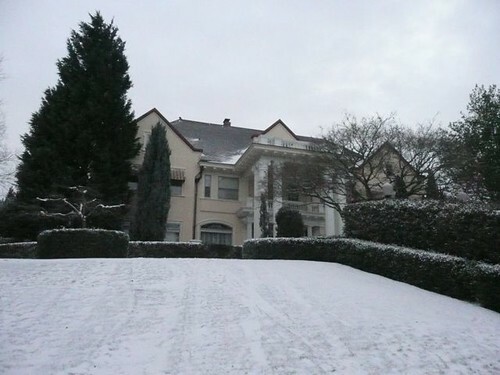 Dear people who lived in the one mansion in the neighborhood when I was 7 and 8, Yes, you have a crazy huge house, we are all very impressed. Did you know that all the kids talked excitedly about your house at Halloween? How you were on everybody’s list, and everyone fantasized that you would hand out FULL SIZED candy bars, because you were obviously rich? So tell me, what was the thinking behind handing out pencils? Pencils? And when we were sure that was just a mistake, that you forgot to buy candy, but surely the disappointed faces of children would prompt you to do better the next year, what was it that made a handful of pennies seem like a good idea? Are you dentists? Dear people with the awesome rock garden, Yes you have a terrific yard and house and everybody looks at you and sometimes you’re featured in the newspaper. Nicely done, bravo, with all the evergreens and interesting shapes and textures. But do you feel like something’s missing since your Agave flowered and died, and you replaced it with a plain old New Zealand Flax? Nothing wrong with New Zealand Flax. I have 3. But so does every Starbucks in town. Your Agave was special. Do you have the same Agave shaped hole in your heart that I have when I look at your garden? Dear super nice next door neighbors, I’m really glad you are here. This is way better than the years the house sat vacant. 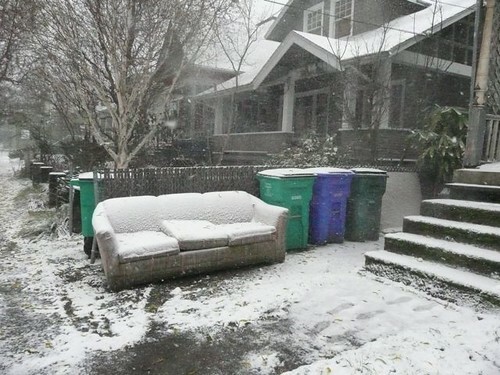 I don’t want to be THAT neighbor, but would it be too much to ask you very nicely, after a good year, if maybe the front yard couch could move along? Or not. No big deal. Maybe you could send an anonymous note to the rock-garden people instructing them on the whys, whats, and wherefores of proper agave replacement. You’d be doing everyone a big favor. Pencils? That’s as bad as the people who hand out pennies. Ok I’ve had a headache all day long so my brain isn’t functioning to full capacity, but I swear that I just read “what was it that made a handful of penises seem like a good idea?” I’m freakin’ cracking up! Oh, I got a chuckle out of this one. Nice wintry walk, hope you didn’t freeze. How are your plants doing? I’m really worried about a lot of mine, it hasn’t been above 30 here since Saturday night! Patricia – you think? How about a mystery present left on their doorstep, a shiny new agave? Chris – we hate them, right? Shala – now that you say it, that’s how I’m seeing it! What did I write? Karen – Everything vulnerable has been all wrapped up, but the wind blew my frost blanket off of my tree fern and papyrus. I think the papyrus is probably toast, and some of the things I should have dug up and brought in are done. I’m just hoping the agaves and tree ferns make it through. So far they look okay. 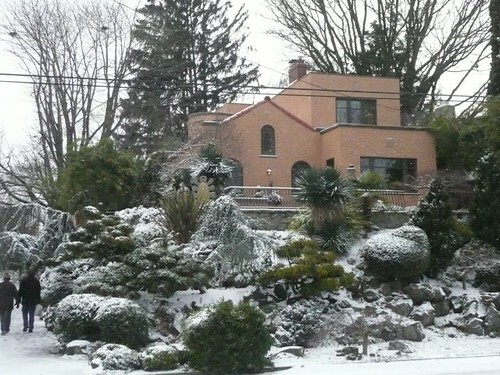 Hey, we passed that rock garden house today and I hollered for a pull-over so I could take pics! I knew I’d seen it somewhere before… I’ll link back to this post if I put up pics of it, since it’s super cool to see it in the snow. We had a great time in Portland, thanks again for all the tips. We ended up at the Chinese Garden FIRST! How amazing is that? And my daughter declared it “fun”! Go figure.